Each input and output port has its own ideas of what "high" and "low" means for the attached equipment. For example: The Global Cache video probe gives a high output signal to indicate that a video signal is being detected. Their TV probe on the other hand pulls the input low when the TV is on. For this reason it is inconvenient to have to program your schedule using the terms "high" and "low" and having to remember what that really means. HomeVisionXL allows you to enter a short reminder of what "high" and "low" means on the summary screen. When editing an action you can now just select the level using those labels. The labels are also displayed in the action editor text and in the full schedule listing. The homevision controller supports a maximum of four serial ports. But who can (or wants to) remember if the thermostat is connected to port 2 and the alarm system to port 3 or the other way around? 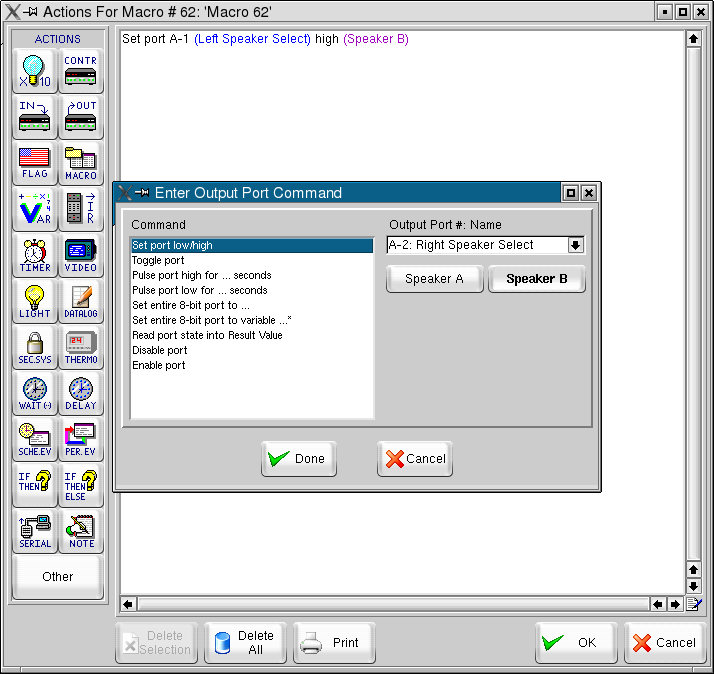 HomeVisionXL allows the user to give the serial ports a name. This greatly improves the chance that serial commands will be sent to the correct port without much effort from the schedule developer. HomeVisionXL allows the user to attach some notes to a homevision schedule. This can be used to document how certain tasks involving a multitude of objects have been implemented, or information about experimental code that needs to be tested over time, or any other information you may want to store together with a schedule.